At a loss for the perfect dinner dish that will leave everyone wanting more? 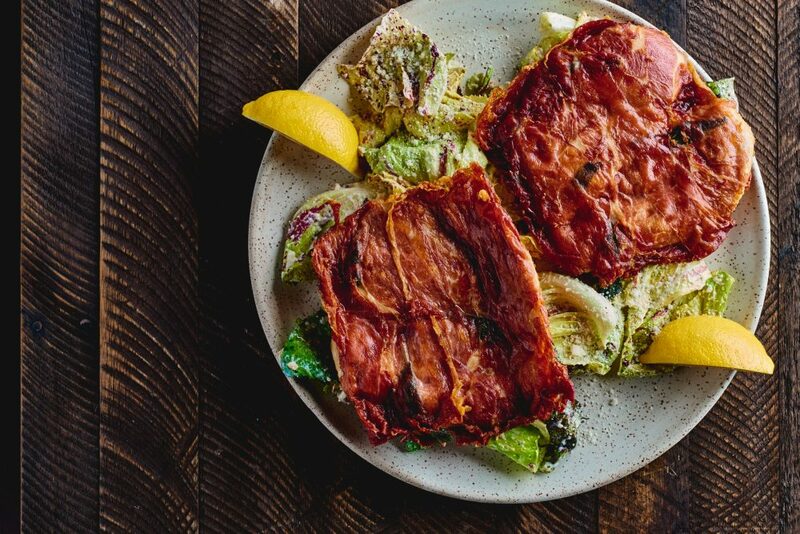 A classic prosciutto chicken saltimbocca is here to answer your prayers. The savory chicken is balanced perfectly with the crisp bitter greens with a garlic, cheesy lemon vinaigrette. And the citrus flavors give the richness a refreshing respite, ideal for any time of the year regardless of season. This prosciutto chicken dish is simple enough for it to quickly become an at-home staple that will impress even the toughest of critics. Pair with your favorite light beer or traditional Italian wine to complete the meal. This recipe comes from our Specialist Chef Joshua McFadden of Ava Gene’s in Portland, Oregon. Photo credit: Ashley Marti. Halve and butterfly chicken breast and pound to an even ½-inch. Season with salt and freshly ground black pepper, sprinkle with sage over top and bottom. Drape the Prosciutto di Parma over the top and bottom of the chicken, making sure sides are wrapped. Begin to sauté in pan with butter on medium heat, 3-4 minutes on each side. The prosciutto will render and become crispy. Set aside to rest and prep bitter greens. Soak chopped garlic in extra virgin olive oil. Add garlic, grated Parmigiano-Reggiano, to taste and fresh cracked black pepper in pan from saltimbocca. With a fork, whisk the mixture to create a paste. Place greens in large bowl and add mixture. Squeeze lemon over the top, a little more of grated cheese, then toss. Place chicken saltimbocca over the greens mixture and serve with lemon wedges on the side.